(1) The Porter-Cable circular saw was effective in completely size-reducing one glovebox FRP crate assigned. (2) The Porter-Cable circular saw is very light and easy to use. LANL technicians stated that this tool is easier than the MILWAUKEE, even though they have to deal with the vacuum hose as an additional attachment. The saw can be used to perform different types of cuts with no difficulties. The Porter-Cable circular saw cut through nails with no problem. However, it could not cut through the stainless steel metal plate. (3) The vacuum system was able to capture up to 87% of the dust generated during cutting activities, which minimizes worker exposure to airborne. (4) Production rate and cutting rate were slightly lower than the MILWAUKEE circular saw but still considered high. The additional vacuum hose that a tool operator needs to carry while cutting may affect production and cutting rates. 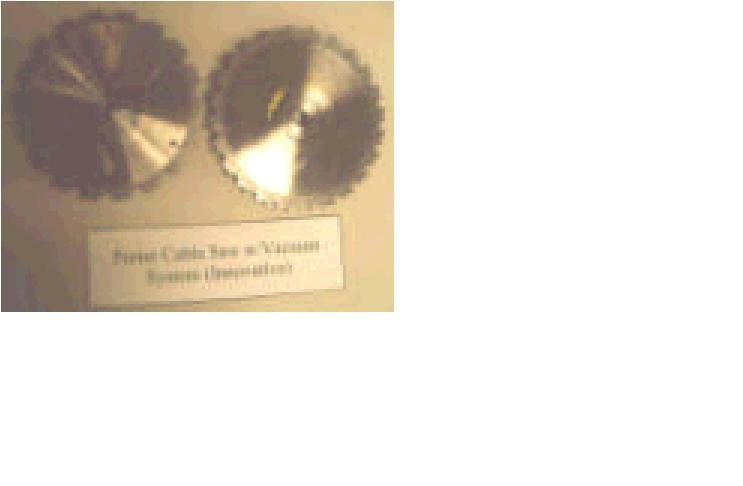 However, LANL technicians found this saw better and easier to use than the MILWAUKEE circular saw. The reciprocating saw was used to finish some small cuts in difficult areas on the crate where the Porter-Cable circular saw could not reach. (5) It is mobile and easy to operate, and set-up and blade replacement are relatively simple. 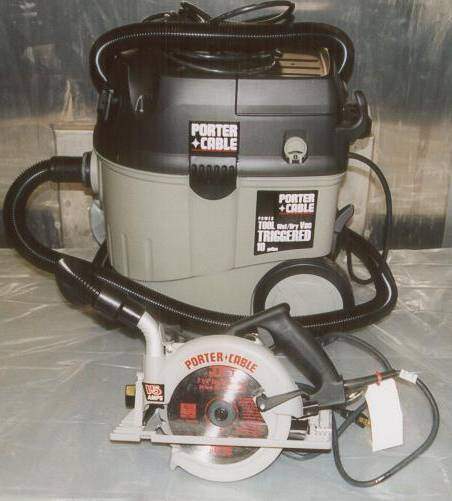 (6) The Porter-Cable circular saw is relatively inexpensive by itself. The vacuum cleaner accessory will increase costs significantly. However, the vacuum cleaner system captures most of the sawdust generated during cutting. (7) Secondary waste generation is mainly fiberglass, wood sawdust, one vacuum bag, and worn-out or damaged blades. (8) Cutting activities can be conducted under safe conditions for operators, evaluators, and the environment. LANL did not experience significant heat transfer while conducting cutting activities. (1) The Porter-Cable vacuum saw inhibits the mobility of the operator when cutting. This tool requires two operators to maneuver it. One is actually operating the saw, and the second one is holding and directing the vacuum hose to minimize interferences during cutting. (2) The Porter-Cable circular saw is a powerful tool for crate opening but needs a reciprocating saw to finish some difficult areas. (3) A drawn cutting line is needed to facilitate straight cuts. (4) The Porter-Cable circular saw produced noise up to 105 decibels (dBA), which represents a potential noise hazard for operators. (5) Vibration levels for the Porter-Cable circular saw were measured in terms of velocity at the rear handle, and they were >0.200 in/sec. Vibration level was above 0.709 in/sec, which is considered a dangerous level. This level of vibration represents a Hand/Arm Vibration Syndrome (HAVS) hazard for workers who use this tool on a regular basis (8 hrs/day). (6) Secondary waste generation was sawdust, up to 87% of which was collected in the vacuum system. Close up View of Porter-Cable circular saw (743K) with vacuum system. Porter-Cable circular saw used blades.